When we gather in ceremony - to welcome a newborn, celebrate a marriage, or bid farewell to those we've lost - we are fully present to our lives and in touch with the deep meaning that feeds our souls. Imagine how our lives might change if we brought the same loving attention to every "ordinary" moment. 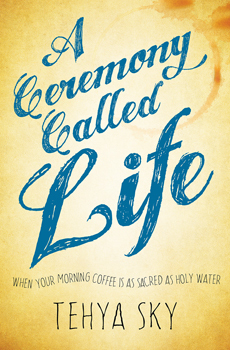 This is the invitation of A Ceremony Called Life, the debut book by new author Tehya Sky. For anyone struggling to find their place and purpose in our ever-changing world, Sky deconstructs our most common spiritual ideas and empowers readers to participate whole-heartedly in the magic and mystery of our human journey. Topics include recalibrating our vision of spirituality; moving through the obstacles that keep us feeling separate; embodying our sacred nature of creator and created; and engaging life as the spiritual practice.